A schematic of the Wikipedia-style approach of the Map of Life. The figure displays all types of input and output that are beneficial to the growth and adaptation of the resource. Image courtesy of Walter Jetz. Where does the red panda (Ailurus fulgens) live in the wild? How widespread is the eastern grey squirrel (Sciurus carolinensis) outside of New Haven? A new Wikipedia-style project, termed “Map of Life,” aims to show exactly that — and much more. The demo version of the project, developed in part by Dr. Walter Jetz of Yale’s Ecology and Evolutionary Biology Department, will soon combine over 500 million digitized spatial records on species from numerous different data sources, making it one of the most comprehensive spatial biodiversity resources yet. 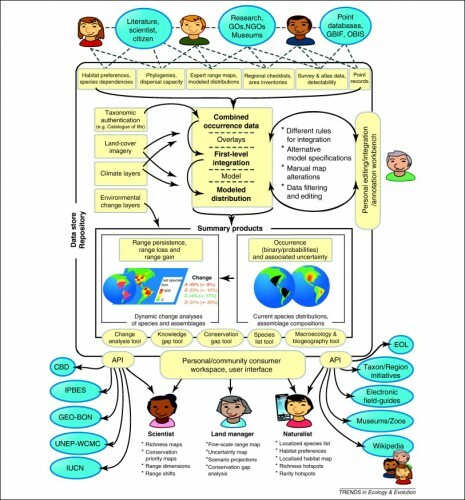 As Dr. Jetz describes it, “the ultimate aim is a public, online, quality-vetted ‘Map of Life’ that for every species integrates and visualizes available distributional knowledge, while also facilitating user feedback and dynamic biodiversity analyses.” The implications and uses of such a resource are innumerable, and it is thought that such an interactive map could eventually aid in understanding the effects of human-caused global change on plants and animals. 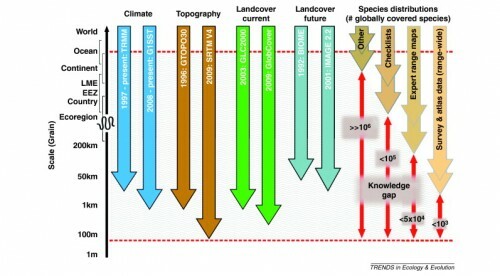 The varying scales of different data types on climate, topography, land cover, and species distributions. This figure documents the varying knowledge gaps in global environmental data and the need to integrate the data for a clearer overall picture. Image courtesy of Walter Jetz. Dr. Jetz defines Map of Life as “a global, collaborative infrastructure for mobilizing, integrating and analyzing spatial biodiversity data.” It strategically incorporates information from a number of sources, including the Global Biodiversity Information Facility (GBIF), the World Wildlife Foundation (WWF), and the International Union for Conservation of Nature (IUCN). These various databases complement, critique, and inform one another, producing dynamic layers of biodiversity distributions overlaid on interactive Google Maps. “Map of Life is more than a sum of its parts; what’s transformational is that these different data types cross-inform each other and help us piece together the most transparent, robust representations of species distribution yet achieved,” Jetz told Nature. The extent of the records is constantly increasing, and the soon-to-be-expanded current demo version supports about 46,000 species, including all described birds, mammals, and amphibians. Another example of the “species distributions” feature of the ‘Map of Life.’ Here, the distribution of the emperor penguin (Aptenodytes forsteri) are overlain on a map of Antarctica. Red dots represent point occurrence of the species, while yellow areas represent breeding areas and blue areas represent non-breeding areas. Image courtesy of Mapping Life. The public demo website (www.mappinglife.org) currently allows users to perform two different operations: mapping species distributions and getting species lists. The first operation allows anyone to visualize the distributions of different species based on the range maps, point occurrences, local inventories, and regional checklists of that species. A series of filters lets you search for species and narrow results by data type and data source. These different layers have varying visual styles to complement and blend with one another. The second function, species lists, allows users to select geographic areas ranging from 50 to 1,000 kilometers and receive a list of all supported species in that range. The results can be filtered by radius and type of animal. Although these functions may seem somewhat rudimentary at the moment, the project is constantly expanding in extent and functions. With hard work over the next few years, this new resource may come out far ahead of any other similar modern tools. 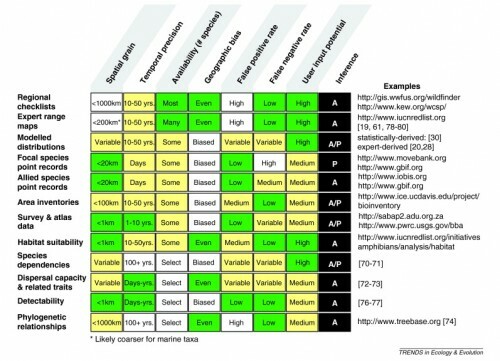 Twelve types of data that provide information on species distributions. Cell entries indicate the nature (text labels) and quality (color, from white=poor to green=good) of the data types according to varying categories and their consequence for inference of fine-grained presence (P) or absence (A). Image courtesy of Walter Jetz. When asked by the New York Times what the inspiration was for the Map of Life, Dr. Jetz cited his days as a Ph.D. student: “As I was running around forests in Africa, I came to the realization that I couldn’t really understand the patterns of species distribution I was seeing without going to broader and broader scales — all of Africa, all of the world.” Jetz stressed the temporal and spatial knowledge, quality, and availability gaps between different types of global-scale data sets on climate, topography, land cover, and species distribution. He and project partner Rob Guralnick proposed the new Map of Life in an attempt to bridge these gaps by incorporating multiple types of data into one simple and cutting-edge public resource. “There is an amazing potential for such a resource to help understand the remaining knowledge gaps and to support the monitoring and analysis of biodiversity change,” Jetz said. His writing outlined the cyber-infrastructure that would support such a resource. Unfortunately, there are no typical federal or agency funding sources for a project of global scope. Nonetheless, this new tool has become a reality with the involvement of Google, NASA, the Encyclopedia of Life Project, and several international research institutions, including the University of Colorado Boulder and the Naturmuseum Senckenberg. An example of the “species distributions” feature of the Map of Life. Here, the different ranges of the Bald Eagle (Haliaeetus leucocephalus) are overlain on a map of the United States and Canada. Yellow areas represent breeding areas, blue areas represent non-breeding areas, and green areas represent resident areas. Image courtesy of Mapping Life. Now that the Map is public, scientists and governments around the world can use the information about the geographic distribution of species to inform conservation efforts and policymaking regarding climate change and even the transmission of zoonotic diseases. In addition to serving these roles, it also helps to expose holes in existing distribution data sets so that future biodiversity research can focus on particular species or specific regions, further developing the Map. However, for the Map to continue to grow it must gain traction in biodiversity circles. As Dr. Jetz told Nature, “the whole idea only works if scientists are keen to engage and contribute to the effort.” He feels there is a good chance the project will prosper because it integrates knowledge in a dynamic format that is accessible to those making decisions about conservation. 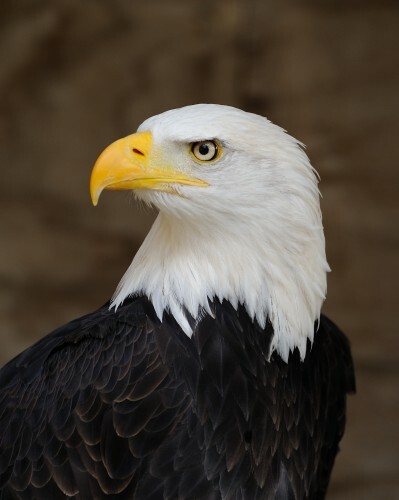 Bald Eagle (Haliaeetus leucocephalus). Image courtesy of W Lloyd Mackenzie. An example of the “species lists” feature of the Map of Life. Here, 50 mammal species are presented that have ranges within a 50 km radius of New Haven, CT. Highlighted species have increased IUCN endangered rankings. Image courtesy of Mapping Life. Finally, Dr. Jetz wishes the project could be used for assessing the response of biodiversity to human impacts like land use and climate change, but there is a dearth of data from the past 10 or 20 years, making it very difficult to analyze these effects. As Jetz states, “to date, even much of what we as a society do know remains unmobilized, non-integrated, unquantified and underused.” Strong efforts from the public and from scientific communities in broadening the extent and applicability of the Map of Life may be the next step to understanding and appreciating biodiversity. With these future contributions, perhaps we will finally be able to understand how the interactions between humans and other animals impact the biosphere and the physical Earth we all call home. Walter Jetz, one of the developers and scientists behind the Map of Life, is a professor in the Ecology and Evolutionary Biology Department. 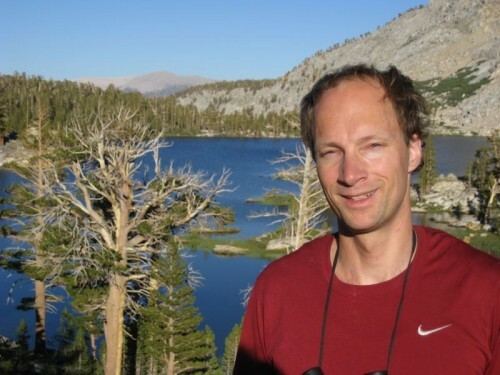 His research attempts to integrate across scales of geography and ecological organization — from global to local assemblages. Image courtesy of Walter Jetz. About the Author: William Gearty is a junior Geology and Geophysics major in Branford College, with a concentration in Paleontology and Geobiology. He works in Elisabeth Vrba’s lab studying mass extinctions and taxa ranges and in Jacques Gauthier’s lab using CT scans to better interpret fossil specimens and evolutionary relationships. Acknowledgements: The author would like to thank Walter Jetz for his correspondence, insight, and enthusiasm regarding the Map of Life project.